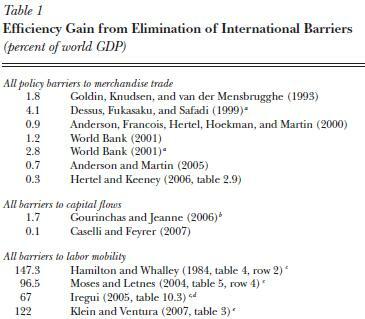 A conservative reading of the evidence in Table 2, which provides an overview of efficiency gains from partial elimination of barriers to labor mobility, suggests that the emigration of less than 5 percent of the population of poor regions would bring global gains exceeding the gains from total elimination of all policy barriers to merchandise trade and all barriers to capital flows. John Kennan wrote a paper titled Open Borders (ungated PDF) a year after Clemens’ paper came out (the original version came out in August 2012, but the paper was updated in October 2012). The data used in the paper is available at Kennan’s research page. Kennan’s calculations also suggest that open borders would more than double world GDP in the long run, though he does not derive numerical estimates for world GDP (even though his model seems detailed enough for such estimates to be obtainable). Referenced in a number of blog posts listed later in the page, but most notably in John Kennan’s open borders by Nathan Smith and Upward and downward biases in the “double world GDP” estimates of the gains of open borders by Carl Shulman. The Global Welfare and Poverty Effects of Rich Nation Immigration Barriers by Scott Bradford (2012). Referenced by Nathan Smith in the blog post Double World GDP? Another Economic Model of Open Borders, June 4, 2014. Ghost of Christmas Past, a commenter on EconLog, has critiqued the “double world GDP” estimates in a number of comments, such as this comment by Ghost of Christmas Past on Caplan’s “National Egoism” post and this comment by Ghost of Christmas Past on Caplan’s persuasion bleg post. Upward and downward biases in the “double world GDP” estimates of the gains of open borders by Carl Shulman, Reflective Disequilibrium, January 26, 2014. The Global Economic Impact of Open Borders: My Take by Nathan Smith, February 8, 2014, where he outlines a theoretical model to estimate the gains from open borders that relies on the efficiency gains arising from clustering in cities. John Kennan’s Open Borders by Nathan Smith, February 11, 2013. This is a detailed analysis of John Kennan’s paper on open borders. Implications of embracing low-end estimates of the global economic impact of open borders by Vipul Naik, February 6, 2014. This considers what embracing the low-range back-of-the-envelope estimates might mean for the case for open borders. Double World GDP? Another Economic Model of Open Borders by Nathan Smith, June 4, 2014. Double world GDP versus scope insensitivity, by Vipul Naik, May 10, 2012, on the Open Borders blog. The story behind the “double world GDP” estimates by Vipul Naik, October 10, 2012, on the Open Borders blog. The Efficient, Egalitarian, Libertarian, Utilitarian Way to Double World GDP by Bryan Caplan, August 20, 2011, EconLog. The place premium. This concept developed by Clemens and some of his colleagues is used to estimate the income gains from full labor mobility that would accrue to people at the individual level. Double world GDP is licensed by Open Borders Admin under a Creative Commons Attribution 3.0 Unported License.